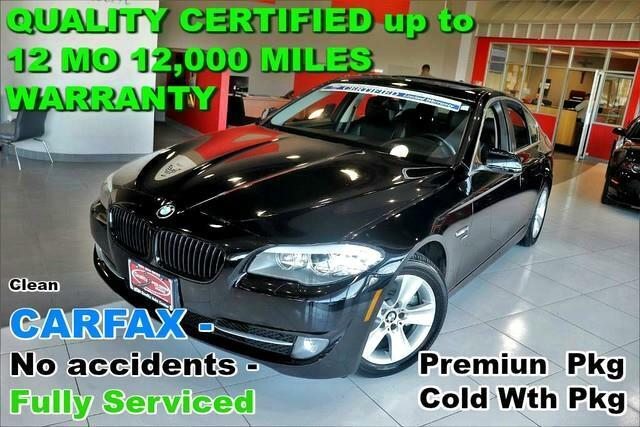 Clean CARFAX - No accidents - Fully Serviced - QUALITY CERTIFIED up to 10 Mo, 12,000 MILE WARRANTY 2012 BMW 5 Series 528i xDrive with 85,829mi. This BMW includes: REAR-VIEW CAMERA Back-Up Camera 18-WAY POWER-ADJUSTABLE MULTI-CONTOUR FRONT BUCKET SEATS Seat Memory Power Passenger Seat Power Driver Seat Passenger Adjustable Lumbar Driver Adjustable Lumbar Bucket Seats TECHNOLOGY PKG Navigation System Back-Up Camera COLD WEATHER PKG Heated Rear Seat(s) Rear Bench Seat Heated Front Seat(s) Pass-Through Rear Seat *Note - For third party subscriptions or services, please contact the dealer for more information. * Put performance, safety, beauty, sophistication and all the right amenities into a car, and here it is! Now you can own luxury without the luxury price tag! Start enjoying more time in your new ride and less time at the gas station with this 2012 BMW 5 Series. All-wheel drive means peace of mind all the time. This Jet Black AWD BMW enjoys a host offeatures, including exceptional acceleration and superior stability so you can drive with confidence. The 5 Series 528i xDrive is well maintained and has just 85,829mi. This low amount of miles makes this vehicle incomparable to the competition. Let's be honest, not everyone wants to set a course blindly into the dark. For those of us that don't, there are vehicles like this with stellar navigation systems. Feel at ease with your purchase of this BMW 5 Series 528i xDrive, all records are included allowing you to truly know what you're buying. Pre-owned doesn't have to mean used. The clean interior of this BMW 5 Series makes it one of the nicest you'll find. Some vehicles are more of a need-to-have. This one is a absolutely-must-have. If it's looks aren't enough to persuade you, the feel of the powerhouse under the hood most definitely will. Driver and passengers will celebrate the comfort and convenience this BMW 5 Series offers with its well-considered features. Added comfort with contemporary style is the leather interior to heighten the quality and craftsmanship for the BMW 5 Series When you see this car in person, you'll ask yourself When did WOW become a color of paint? Stand out from the crowd as a 2012 BMW 5 Series 528i xDrive is a rare find and just may attract paparazzi. More information about the 2012 BMW 5 Series: The 5-Series lineup of models offers athletic and surefooted sedans that also offer a surprising level of comfort inside. Technology is also a strong point in the 5-Series, with performance and safety standouts such as Active Steering, Active Roll Stabilization and a night vision system. The 5-series Grand Turismo Wagon is a very fashionable and fun-to-drive alternative to a sport-utility vehicle. Strengths of this model include Athletic handling, impressive high-tech features, understated styling, powerful and refined engines, and superior ride quality No Credit / Bad Credit / No Paystubs, No problem !! ! All Approved ! Everyone drives ! CLEAN, GORGEOUS, LOW MILES, SHOWROOM CONDITION. CALL NOW QUALITY CERTIFIED up to 10 YEARS 100,000 MILE WARRANTY , To Certify a vehicle, there will be an additional cost for Certification. CALL NOW For details. STUNNING AGGRESSIVE LOOK ON THIS BEAUTIFUL--Call today to schedule a test drive... Good Credit/Bad Credit/No problem!!!! Get paid cash? No problem!! 100% Credit Approval with interest rates starting at 2.49% for qualified customers, our rates will not be beaten. We price our cars at wholesale price to guarantee the best deals for our customers. Our inventory moves quick, please call to confirm the availability of the vehicle of your interest Springfield location 973-564-0112. This vehicle is located at our SPRINGFIELD location. Come visit our new showroom in Springfield NJ. Looking for a clean, well-cared for 2012 BMW 5 Series? This is it. This BMW 5 Series 528i xDrive is for the discerning driver who demands the utmost of his vehicle. This wonderfully fuel-efficient vehicle offers a supple ride, quick acceleration and superior styling without sacrificing MPGs. This BMW 5 Series features AWD. That means power and control delivered to all four wheels for maximum grip and improved handling. The 5 Series 528i xDrive is well maintained and has just 85,829mi. This low amount of miles makes this vehicle incomparable to the competition. More information about the 2012 BMW 5 Series: The 5-Series lineup of models offers athletic and surefooted sedans that also offer a surprising level of comfort inside. Technology is also a strong point in the 5-Series, with performance and safety standouts such as Active Steering, Active Roll Stabilization and a night vision system. The 5-series Grand Turismo Wagon is a very fashionable and fun-to-drive alternative to a sport-utility vehicle. Interesting features of this model are Athletic handling, impressive high-tech features, understated styling, powerful and refined engines, and superior ride quality No Credit / Bad Credit / No Paystubs, No problem !! ! All Approved ! Everyone drives ! CLEAN, GORGEOUS, LOW MILES, SHOWROOM CONDITION. CALL NOW QUALITY CERTIFIED up to 10 YEARS 100,000 MILE WARRANTY , To Certify a vehicle, there will be an additional cost for Certification. CALL NOW For details. STUNNING AGGRESSIVE LOOK ON THIS BEAUTIFUL--Call today to schedule a test drive... Good Credit/Bad Credit/No problem!!!! Get paid cash? No problem!! 100% Credit Approval with interest rates starting at 2.49% for qualified customers, our rates will not be beaten. We price our cars at wholesale price to guarantee the best deals for our customers. Our inventory moves quick, please call to confirm the availability of the vehicle of your interest Springfield location 973-564-0112. This vehicle is located at our SPRINGFIELD location. Come visit our new showroom in Springfield NJ.